WTF?? I hear you cry. That is exactly what I thought. Do not be afraid. ‘Grimsey’ means Trent Grimsey. Which is the name of the man who currently holds the world record for the infamous swim across the English Channel, which he completed in 6 hours and 55 minutes. Look it up on YouTube because for almost 7 hours he swims faster than I can swim for 30 seconds and every stroke is perfect. I had tears in my eyes watching it. For 8 years Grimsey competed as a professional marathon swimmer and when he retired from that insanity in 2013 he settled himself approximately 30 minutes from where I live and SET UP A SWIM SCHOOL for adults who want to swim in open water. Quite how I managed to not know this information is worrying. I mean, is my next door neighbour a cycling coach that specialises in beginner triathletes? PROBABLY. 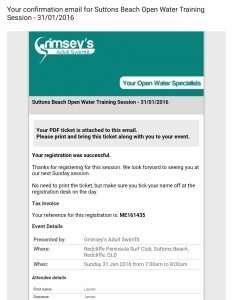 So, every fortnight on a Sunday morning at 7am, Grimsey holds a special Open Water Clinic that goes for an hour, which (and this is an actual quote from the website) ‘covers everything you’ll need to know about open water swimming from starts, pack swimming, turn buoys, sighting, drafting and finishes‘. Honestly as I read this on the website I wondered whether every triathlete in the world had just quit the sport – why were the Triathlon Gods honouring little old me with this incredible miracle? If I had known what would have pleased them in return I would have made it so. A sacrificial lamb or something. Nah I would have just gone down the supermarket and bought some lamb chops, but whatevs Triathlon Gods, I will hook you up with lamb carcass if that is what you require. I owe you big time. To add insult to injury, this clinic will set me back twelve dollars. Yes you read that correctly. Clearly, the Triathlon Gods know I am poverty stricken by their stupid sport. I wept with joy, as was appropriate I think. Now… I discovered this website on Wednesday last week and the clinic for yesterday (Sunday the 17th) was already completely sold out. And you couldn’t register for the next one at that point (which will be on my birthday) because I guess they release them one at a time. This worked in my favour, because as excited as I was about discovering this little miracle, part of me was wondering whether I met the requirements of attendance – the website clearly states that all attendees must be over 12 years of age and a competent swimmer. I know I am one of those things but I was seriously dubious about the other. But once I realised that these suckers sell out, well frankly my competitive spark ignited into an inferno and I knew I needed to get myself on that list, whether I count as competent or not. All day yesterday I waited eagerly, refreshing the registration page regularly in a manner reminiscent of the Noosa sign-up, ready to beat all the other idiots who might be wanting to register. And eventually last night, the session for 31st January had been released and I was able to sign up. I’m in. So now I have two weeks to ensure a world record-holding open-water marathon swimmer (aka Grimsey) will fall for my pretense that I am a competent swimmer. Yikes. Better get in the damn pool. This entry was posted in Show Me Swim and tagged bribie, coach, freestyle, newbie, strategy, swimming, training, triathlon, Triathlon Gods, unicorn. Bookmark the permalink.